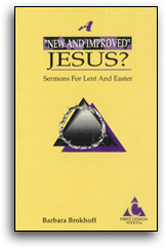 A 'NEW AND IMPROVED' JESUS? Stories of holy communion events abound. Someone has said that the difference between a Lutheran and a United Methodist is that a Lutheran uses real wine and a United Methodist uses real bread. It is true that Lutherans use real wine and United Methodists seem to feel that Jesus turned the water at Cana into Welch's grape juice; that Lutherans use the small, round pressed wafer and the United Methodists often use a loaf of bread.